This panel of The Descent from the Cross entered the Thyssen-Bornemisza collection before 1930 and was tentatively attributed in catalogues of the collection published prior to 1981 as by Pietro Cavallini (ca. 1250–ca. 1330), for unexplained reasons. In 1927, however, the art historian Pietro Toesca expressed his disagreement with this attribution in a letter to the art dealer Julius Böhler who owned the painting at that date. The letter is now in the archives of the Museo Thyssen-Bornemisza. Since it was first published by Evelyn Sandberg-Vavalà, the painting has been attributed to various artists including Giovanni Baronzio da Rimini (active ca. 1326–before 1362) and two anonymous painters. Edward B. Garrison was the first to attribute the panel to a newly rediscovered artist known as the Master of Forlì. In addition, he was the first to propose a group of works for this artist and to define his style. Garrison related the present panel to three others: The Flagellation of Christ (The Metropolitan Museum of Art, New York), The Disrobing of Christ(present whereabouts unknown; pair to the present panel when in the Maitland F. Griggs collection, New York); and The Burial of Christ(The Metropolitan Museum of Art, New York). According to Garrison, these four scenes from the Passion would have formed the lateral wings of a triptych that was dismantled at an unknown date and whose central panel might have been a Crucifixion. This suggestion was accepted by Boskovits who, however, suggested that the central image was a Death of the Virgin, while the exterior images were a Crucifixion and four saints. 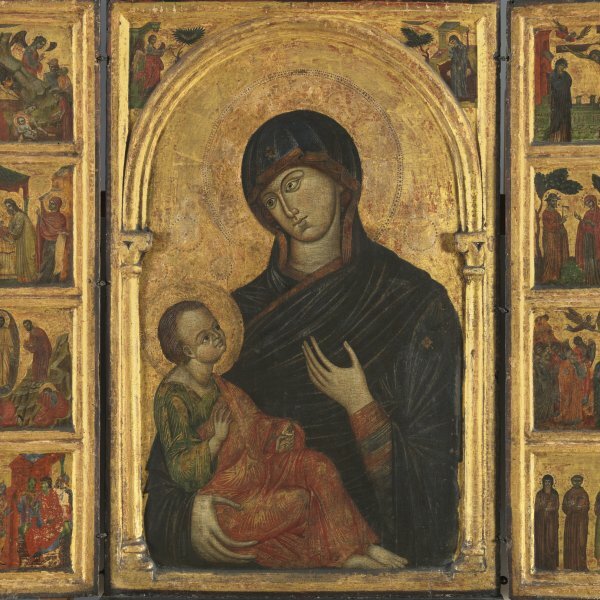 The exterior paintings are now in the Pinacoteca Comunale in Forlì. In the present panel the Master of Forlì follows the traditional Byzantine formula. 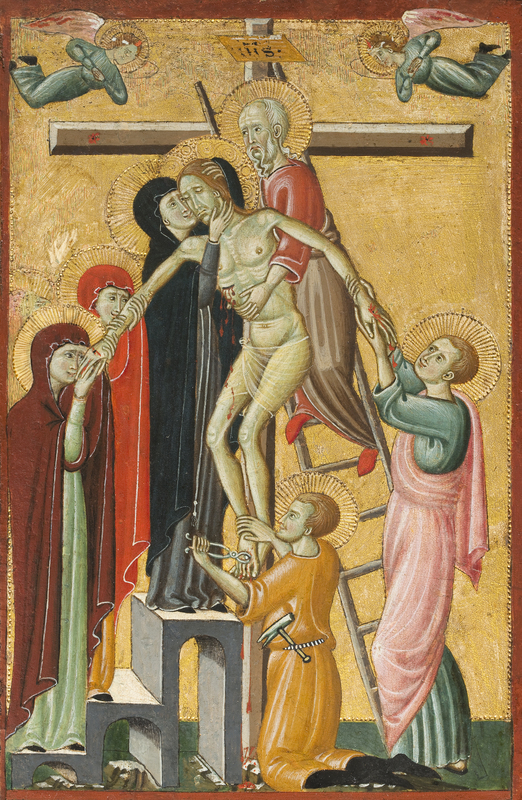 Standing on the ladder, Joseph of Arimathaea supports Christ’s body in his arms while Mary embraces her son. Saint John on one side and the holy women on the other support his arms. The artist located Nicodemus kneeling at the foot of the cross with a hammer in his belt, pulling out the last nail from Christ’s foot. As Boskovits noted, the artist describes the scene emphasising purely ornamental values and line. The technique is detailed, as can be seen in the heads of the figures and in Christ’s body, whose bones and muscles are carefully depicted. This artist was, however, familiar with Giotto’s compositional and spatial innovations, which he incorporated into his work and which are evident here in details such as the steps beneath the holy women and Nicodemus’ pose.